Stability of Sulfides - backbonding? 1) Is the above excerpt describing pi-backbonding? 2) Is pi-backbonding more favorable for metals in a low rather than a high oxidation state because such metals still have substantial electron density that needs to be stabilized - and preferably stabilized by something more electronegative than a metal? Is the overlap between the metal d-orbital and non-metal p-orbital as poor as depicted? Are the d-orbitals really at a 45 degree angle relative to the p-orbital? A) The passage seems to imply that Bronsted acidity and basicity do not depend on the corresponding base or acid. Wrong implication. HCl in HBr solvent won't be a strong acid. B) Why electron density might just "drift" to the non-metal could be explained explicitly. I.e. electronegativity. 1) Yes and no ... the d-d orbital overlap will almost certainly have pi-orbital character (angular node along bond axis), and it could reasonably be considered "backbonding" because the electron density is going in the canonically "unexpected" direction (i.e. away from positively charged metal center). 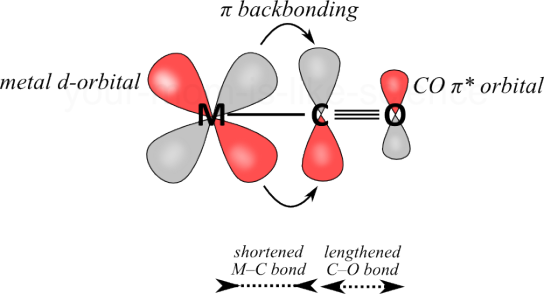 On the other hand, chemists (particularly inorganic chemists) usually restrict the phrase "pi-backbonding" to refer to back donation from the d-orbitals of a neutral or ionic metal center into anti-bonding orbitals of a ligand, typically an olefin or a carbonyl ligand. 2) Yes .. that's essentially correct ... d-orbitals tend to be rather diffuse, and so can overlap with lobes of diffuse orbitals on ligands (or counter-ions, as with the metal sulfides). In traditional metal-ligand pi-backbonding, lobes the d-orbitals overlap with lobes of an unoccupied anti-bonding orbital of the ligand. In the example given above, they overlap with lobes of unoccupied d-orbitals on the sulfur. For a given system, unoccupied, or virtual, orbitals tend to be much more diffuse than occupied orbitals. 3) Those diagrams are just intended to capture the qualitative aspects of the bonding interaction, such as the symmetries of the orbitals involved. Remember, the orbitals are 3-dimensional shapes that describe the probability of finding an electron with a particular set of quantum numbers in a given region of space. Depictions like the one in your post are helping to visualize the orbital by assuming a fairly tight "tolerance" for the probability. For example, those images might depict the surfaces that enclose 75% of the total probability density. If you expand that to 90%, or even 99%, the lobes maintain the same basic shapes but get much larger, which might make the overlap seem more significant, but could also be confusing for other reasons. 4) I think it is quite well-written, but I suppose it would depend on the broader context in which it was being presented. I guess it is presented at an inappropriately high level for an introductory chemistry textbook, for example. Not the answer you're looking for? Browse other questions tagged inorganic-chemistry acid-base or ask your own question. Why does strong Lewis acid-strong Lewis base interactions prevail over hard-soft acid-base interactions? Can ethanol be both a Lewis base and a Lewis acid? Why do electron donating groups decrease the acidity of aromatic carboxylic acids?